The first thought that comes to mind when we hear driving in city traffic is standstill traffic surrounded by pedestrians with constant stop-start movements. For some drivers, this is their worst nightmare mainly due to the busyness of their surroundings and the heavy reliance on clutch control, but similar to any driving skill, it’s easy to hack through practice. At some point in your driving life, you’re more than likely going to have to tackle driving through a city in rush hour. We all dread knowing we’re going to hit rush hour traffic, but in most cases, it’s simply unavoidable. Unfortunately, if drivers are held up from getting to their destination as quick as possible, frustration starts to build up and tempers are lost, which is why it is vital to know how to handle the task of busy city driving and not fall into the trap of losing your patience and putting yourself, along with other road users, at danger. Our top tips are easy to follow and quick to pick up, so keep reading to find out more! It is so easy to get distracted while sitting in traffic, thoughts such as “oh I’m not moving any time soon, so I may as well reply to this text” or “I think I have time to open and eat this quick snack to pass the time”. Don’t fall victim to distractions while you’re stuck in traffic, always stay focused on your surroundings. As mentioned previously, clutch control is vital when in traffic and unless you have your handbrake on, you must remain on the brake pedal. You’d be surprised how many drivers lose concentration, and their foot slips off the brake, then they end up rolling forward into the back of the car in front. Or on the other hand, they raise their clutch slightly too high and stall, then panic because traffic has started to move finally or the traffic light in front has turned green. 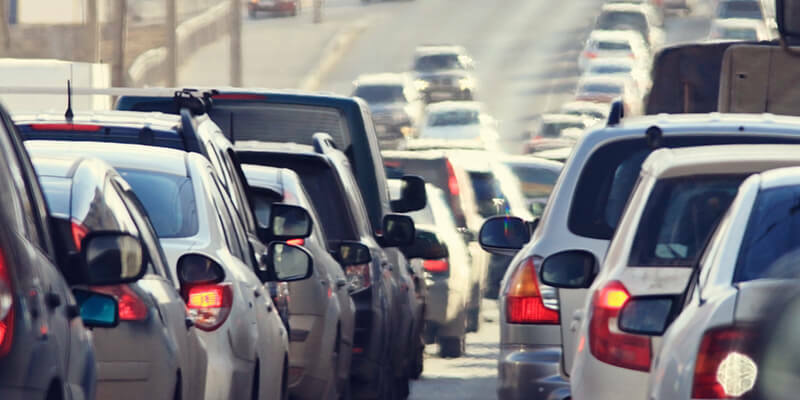 Remaining focused is not only essential to save frustration from other drivers, but also because there are significantly more potential hazards surrounding you when you are in a busy city. Always look out for vulnerable road users such as pedestrians cutting through the traffic to cross the road, cyclists trying to get ahead of traffic, dogs who may run out into the road and people who are leaving buses. Although parking isn’t necessarily driving, it is a task that you will always have to tackle no matter where you are. If you’re visiting a new area or city you are less familiar with, always do a little research before you leave to track down the best parking options and whether you must pay. Give yourself more than one choice just in case there are no available spaces, especially if you plan to go for a day out and require long-stay parking. We strongly suggest downloading the app Parkopedia or using its website to find parking before your trip. It allows you to input the area in which you plan to travel or the postcode, and it will tell you a vast list of possibilities along with prices and maximum stay times. Remember, cities are full of double yellow lines which means no parking, even if it is just while you pop into a shop. Traffic wardens are a lot more strict in busy areas, so don’t run the risk of being caught out. When approaching a roundabout in busy traffic, it will be improbable that you will get the chance to cut in if you find yourself in the wrong lane and if you do, it’ll be with great difficulty. You may get the odd nice driver who will; wait to let you move over, but it is very rare when everyone is in a rush to get out of the standstill traffic. If you do find yourself in the wrong lane, we suggest sticking to the safest option and continuing to follow the roundabout in the lane you are in. You can always just turn back on yourself on the next roundabout and then continue your route. The rules regarding driving in and around bus lanes is often a topic drivers are less aware of. Along with heavily populated cities comes a rise in the use of public transport, people find it a lot easier to jump on a bus than drive around wasting money on fuel and parking tariffs. The more buses, the more bus stops, so always make yourself aware of what you can and cannot do. For a full guide on this, take a look at our previous article titled ‘Can You Drive In A Bus Lane?’. Sometimes, primarily if you work the regular 9-5 job, it is simply unavoidable to miss rush hour, but if you’re just going out for anything non-work commitment, alter your times a little, so you avoid the busiest periods. If you are taking driving lessons, always try to avoid booking lessons during rush hour, your time will be wasted stuck in traffic, mainly if you are located in the middle of the city centre. You’d be surprised how quickly a one hour lesson goes by, so utilise it to your best ability practising skills such as manoeuvres or test routes rather than in a traffic jam. Although this is helpful to experience constant stopping and starting, you don’t want to do every lesson like this. If you live in places like London, it is worth taking a couple of lessons during busier times to get yourself used to busier periods. We spoke to one of our instructors who has been part of our driving school franchise for years teaching driving lessons in Romford about pupils taking lessons during rush hour. Built-up areas vary between 20mph and 30mph zones, so always ensure that you are meeting the speed limit. It can be easy to miss the odd change in speed limit sign; they often get hidden behind buses or overgrown greenery. Cities also have considerably more speed cameras as councils know its one of the main places drivers can get caught out, so make sure you’re within the limit and don’t get faced with a fine. Unfortunately, the bigger and busier the city, the higher the crime rate. When parking, opt for a secure car park that is well lit with a lot of people around to deter thieves. Always either take all valuables with you or lock them away out of sight in, for example, the glove compartment. Be more proactive fitting extra security measures if you know your car will be left overnight in the city. Consider purchasing a wheel lock and ensure that your vehicle has a car alarm, although make sure it is not one of the extra sensitive ones that sound as soon as a pedestrian walks past. We hope our article has been helpful in making driving in the city a little easier, good luck!